In-Home Music Lessons With Heritage Home Conservatory. Choice of Piano, Voice, Guitar, Flute and More! (Value $132). Adults and Children Welcome! We were just sitting around listening to the Conejo Deals' Greatest Hits album featuring songs like "Paying Retail is So Nineties" and "The Tech Support Hop" when we received today's musical deal. 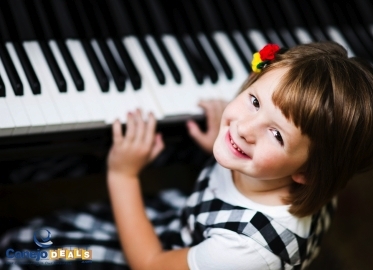 For just $29 for 4 30-minute lessons, $44 for four 45-minute lessons, or $58 for four 60-minute lessons, you and/or your children can learn the instrument of your choice (including voice!) in the comfort of your home at a sharp price that won’t leave your wallet flat.